Edward S. Curtis ran a race to document and preserve Native American life before it vanished. The self-taught, profoundly gifted portrait photographer won prizes wandered into an association with scientists who hired him to document their expeditions. This opportunity led to his nomination by industrialist/philanthropist J.P. Morgan to produce a massive study, The North American Indian, which appeared in 20 volumes between 1907 and 1930. Although he employed numerous assistants to collect, interpret, and record data, Curtis himself recorded more than 10,000 wax cylinders of Native American speech and music, and took more than 40,000 photographs of his subjects. His efforts bankrupted him, caused his divorce, alienated him from his family, and led to his selling off his work at rock-bottom prices. A self-educated ethnologist of the highest degree, he proved again and again incapable of monetizing it. While studying the Kwakiutl tribe of British Columbia, he got the idea of creating a feature film, interweaving documentary-style recreations of tribal culture with . . . a romantic plot. The result is In the Land of the Head Hunters. 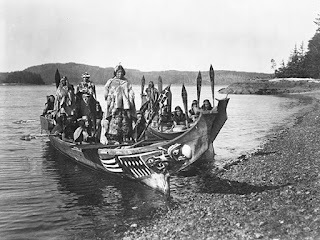 The idea of combining “genuine” footage of aboriginal people with a concocted plot was common at the time, used previously in films such as White Fawn’s Devotion and Hiawatha, and more were on their way. These early docudramas were compromises between the desire to capture authentic images and the fear that a narrative was needed to keep audience engaged with the movie. The results were mixed – films like Nanook of the North and Chang were praised, most others were mish-moshes of plots lifted from European romance and fairy tale. All these films were marinated in sentimental regret, ironic mourning for the cultures that technology was destroying. Curtis was different. He didn’t condescend to his subjects, and his portraits of them – some of the best portrait photography of all time – clearly communicated his respect for them. The imposed love triangle plot in Head Hunters is clumsy, but it chains together the non-narrative patches adequately. Again, Curtis was wrong about the money end of things. He spent $20,000 to produce the film; it only made $3,269.18 on its initial release. The film was lost for decades, until a single damaged print was fished out of a dumpster and donated to Chicago’s Field Museum. A reconstruction took shape in 2008. What remains to be seen are 40 intermittently fascinating minutes. The melodramatic, fictional parts are tiresome but the depiction of beautiful, intriguing rituals, dances, clothing, ceremonial architecture and more (all forbidden by the Canadian government as part of their assimilation plans for their indigenous citizens, and so trotted out happily by the participants) are fascinating in and of themselves. An unintended but most vital side effect of efforts such as Head Hunters has led to the recovery of some tribal language and culture by the descendants of the subjects of study.